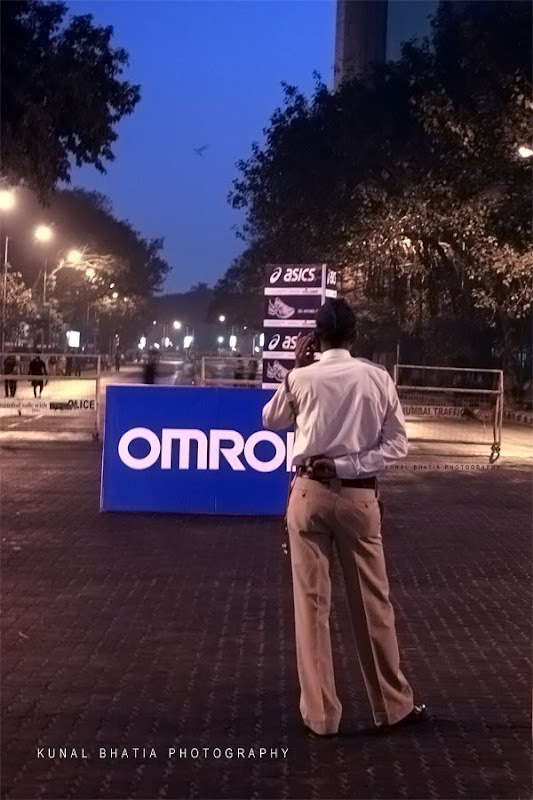 a constable from the mumbai traffic police overlooking bandobast (arrangements) for an event in south mumbai. oh those Police jargons, Mumbai is so well versed with them. Great shot. Nice view of the situation and gives us a look at wht the policeman sees. Nice site as well I shall return to see more, all the best. This is really early morn, seems more like late night :) btw nice capture! nice photography blog! it was really helpful site for me :) thanks for sharing..
Hope to see you on my blog...sometime! Very nice picture. Thanks for sharing. Pleasant perspective of the circumstance and gives us a gander at the policeman sees..love the beautiful packs which light up one's personality.Great photograph blog! Wonderful picture of mumbai city. Hi kunal,Nice capture.Thanks a lot for sharing this with us. Some of fantastic post are here. I like this type of photos very much..